This beautiful silk gown is trimmed with lace both at the edges of the bodice and sleeves as well as in patterns on the petticoat and skirts. 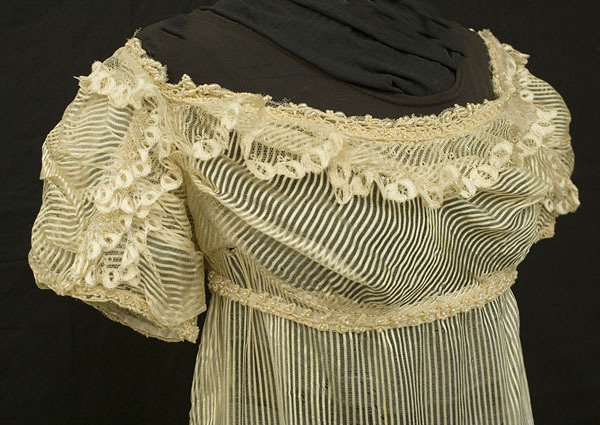 This silk gauze gown from the beginning of the 19th century has a large lace frill about the neckline as well as bits of matching lace on the short sleeves. This taffeta gown as a simple lace frill all the way around the neckline. 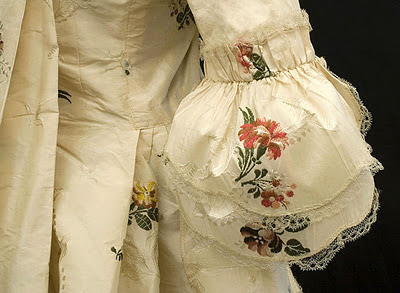 *It should be noted, however, that the two most common uses I see in books are lace trim on shifts/chemises or on corsets, and this IS incorrect for the era. I don’t start to see such trims on extant garments until the mid-Victorian period (c. 1850-1860). Beautiful pictures! It's interesting how understated and delicate the usage is - just a slender trim in most cases. I would have imagined it more heavily used, but it makes sense that it is not given that everything was handmade! Isobel, these photos are gorgeous, esp. the sacques gown. I have never heard the term "blond" before, for lace, and I fancy myself a costume person. So I'm thrilled to have learned a new term. But was "blond" applied to black lace as well? @Leslie: Yes, but it was "black blond" (which I know confuses a lot of people, LOL!). c. blond(e lace : see B. 2. 1771 T. Smollett Humphry Clinker I. 147, I missed three-quarters of blond lace. c1840 C'tess Blessington Sketches & Fragm. in C. Gibbon Casquet of Lit. (1877) I. 216/2 Wore my new Parisian robe of blonde lace. 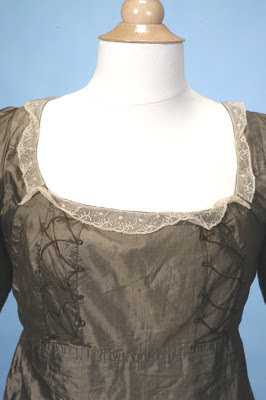 Blonde lace, any of several light-coloured laces. Originally the term referred to continuous-thread bobbin laces made in France from unbleached Chinese silk beginning in the mid-18th century. Later the term blonde was extended to include laces of bleached silk (white blonde) and black-dyed silk (black blonde). They were made at Bayeux, Caen, and Chantilly in the north, and imitations were produced in England during the lace’s most fashionable period."